Back to the Wandle for an afternoon that turned into an afternoon & evening. 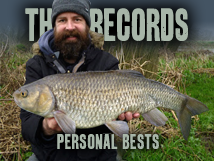 Result: 4 barbel, 1 roach, 1 dace, 1 eel and a crab! 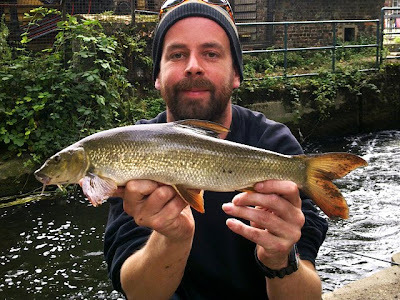 Hit the two pound mark with an exactly 2lb barbel (photo above) - they are getting bigger (slowly). Never caught a crab in freshwater before, must be a foreigner, unfortunately the photo didn't come out. Update: I looked it up and I think the crab was a Chinese Mitten Crab, escaped from a restaurant. I think thats a relative of the Japanese wooly hat lobster. Paddy Pike, Cheers, got it from the weir but I think that's about as big as they get there. I've had a look downstream and saw one about 3-4lb in the shallow water... More exploring required.